Floor mats are something you probably don't think about very often. But if you consider the cost of replacement carpet for your car, floor mats suddenly become a fantastic value. Floor mats are required equipment when it comes to protecting your investment, especially if you live in an area that sees lots of winter weather. 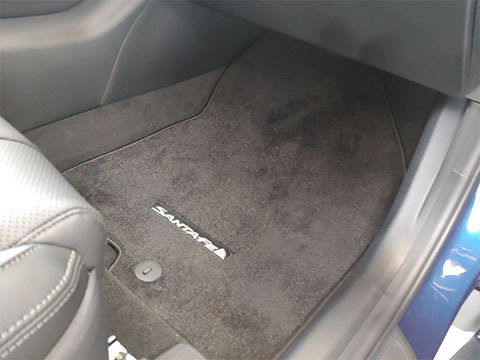 Without a good set of floor mats, slush and snow can soak into your car or truck carpet, through the carpet padding, and begin rusting out the floorpans--without you even knowing it! Protect your investment with these custom designed and color matched floor mats. Nibbed underside will ensure a non-slip fit. Customized with an embroidered Santa Fe logo.